"It bobbed its head," he said. "I heard a loud whistle. It wasn't like a person's whistle. It was a female elk chirping sound, but a higher pitch." The creature walked toward the sound. Violette later found three sets of 16 inch footprints and three sets of 9-inch footprints. He theorized that the creature he saw was a juvenile bigfoot, and the mother bigfoot was the one that whistled. Violette hosted an investigation for the creature from Sunday, March 24, through Wednesday, March 27, at the Armstrong Campground in the Mt. Hood National Forest. The area is rife with Bigfoot sightings, and a 2015 book refers to the stretch of Highway 224 that runs through the forest as the Oregon Bigfoot Highway. "There have been 60 years worth of sightings along the highway," Violette said. One story from the 1960s tells of a logger in the forest who was changing the tire on his truck near Fish Creek Campground. He looked up after feeling uneasy, and saw a giant hairy creature staring at him. He sped off before his new tire was bolted onto his truck. Additionally, Violette noted that employees of the Ripplebrook Camp Store have reported seeing Bigfoot through their window. During an investigation near Fish Creek on Sunday, March 24, he took a photo that he considers to potentially contain Bigfoot. The picture has a black spot with a head and an arm in the trees of the forest. "I consider (the photo) a possibility," he said. "I try to be science-based in everything … I don't base a lot on speculation. It's interesting, but it's not conclusive." While searching for Sasquatch, Violette carries a camera and wears a GoPro. "A lot of times, you can catch on camera what we didn't see ourselves," he said. Violette and his colleagues search for large footprints, which are a rare find. They also keep an eye out for tree structures. "Bigfoot tends to break trees and build huts," he said, noting that the creature also makes a habit of pulling up small trees and putting them back in the ground upside down. "I've found (the huts) in places where I knew people weren't going." Violette's interest in Bigfoot began when he was a child and he saw the Patterson-Gimlin film in 1967, which contains footage of an unidentified creature walking across a riverbank in California. He has several copies of Bigfoot prints cast in hydrocal and noted that the foot is different than a human one — it's longer, doesn't have an arch and bends in the middle. One of the prints, a copy of the one from the Patterson-Gimlin film, was found 20 years later in China. "If it was faked, it was faked 20 years apart and on different continents," Violette said. He noted that there are fossils from an 8-foot upright walking creature from the Bering Strait in China, which might explain Bigfoot's origin. "It possibly migrated with us, but stayed away from us because it was scared of our technology — speers and fire, and developed a fear of humans," he said. Rather than a single mythical Bigfoot, many of the creatures are thought to roam the earth. The Bigfoot Research Organization estimated that there are 2,500 in the Pacific Northwest. Violette receives 20 to 30 reports of encounters of Sasquatch across Oregon each year. He deems some credible, while others, such as a woman who claimed to have a physical relationship with the creature, less so. Though he doesn't necessarily agree with all of the theories about Bigfoot, Violette believes the creature does exist. "I've studied the evidence and I find it credible," he said. "There are a lot of theories, and they're theories. We need to prove the existence first." 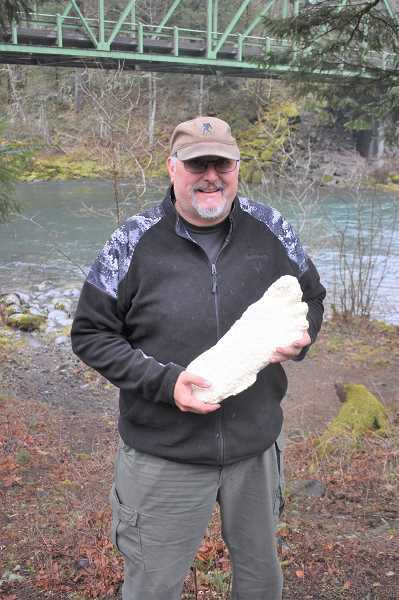 For more information about Scot Violette's company Blue Mountain Bigfoot Research, visit www.squatchoregon.com. The group will host the Blue Mountain Bigfoot Fest on Saturday, June 15, in Baker City.